1 of 3 Heat oven to 375 degrees F, or heat gas grill to medium-hot. 2 of 3 Cut off one thin lengthwise slice from each zucchini (about 1/4 inch thick) and discard, or save for salad. Scoop out each zucchini with melon-ball cutter or small spoon, keeping outer skin intact, to form little boats. Chop the scooped-out pieces of zucchini. Mix together with the onion and walnuts in a medium-size bowl. 3 of 3 Heat the olive oil in medium-size skillet. Add the zucchini mixture; saute for about 5 minutes or until the onion is softened and any liquid has been cooked off. Remove the skillet from the heat. Stir in bread crumbs, Parmesan cheese, parsley, 3/4 teaspoon of the salt, thyme, oregano and pepper until well mixed. Sprinkle the inside of the zucchini shells with the remaining salt. Spoon the zucchini stuffing into the shells, dividing equally. 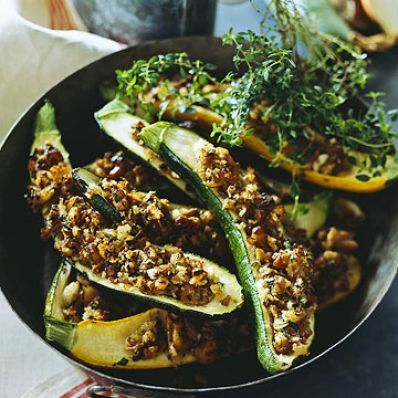 1 of 1 Place the zucchini shells, stuffed side up and side by side, in a baking dish large enough to hold them snugly. Bake in 375 degree oven for 20 minutes. Brush with melted butter; bake another 10 minutes. 1 of 1 Place the zucchini shells, stuffed side up, on the grill rack. Cover the grill and cook 15 minutes. Uncover the grill; brush the tops of the zucchini with the melted butter. Re-cover the grill; cook for another 10 to 15 minutes. Makes 4 servings.